In a recent blog post, Brandon Mahoney asked How Big Can CMS Infrastructure Get? with the short answer being as much as you want to spend. It is true today as it always has been, that you can build any infrastructure to fulfill any set of requirements and requirements such as disaster recovery and performance traditionally can drive you to provision infrastructure that will for the most part remain idle in a data centre. Take a cloud based approach and you can change your overall footprint of infrastructure which will save costs and improve agility. So how can you avoid over spending on infrastructure but achieve your requirements? Automate everything – if you do something more than three times, write a script or process for it. AWS provides you with a significant tool set to implement this strategy and I will outline, using SDL Web as the example, how you can implement these tools to approach building low cost and agile infrastructures. I have blogged many times on performance of publishing and why with the right setup you can achieve a high-throughput of items published from SDL Web (formerly SDL Tridion). In a previous life with a previous approach to infrastructure, I had helped a customer reach a peak of 850 thousand items publishing in a day. I suspected we could have gone higher but this was the natural load and we never got to give the production infrastructure a full stress test. The implemented infrastructure relied very heavily of physical servers and lots of them to achieve such a high throughput. But this is not the pattern we need to follow, so how do we do this? Publishing in SDL Web, is a more or less stateless process meaning that the queue and the data is outside the process itself, however, during rendering of a publishing job state is held on disk and memory. Whilst it is normal to hold some state in memory or disk, a rendering job could be a significant batch job executed by one server and this poses a complication to scaling down which we need to address. 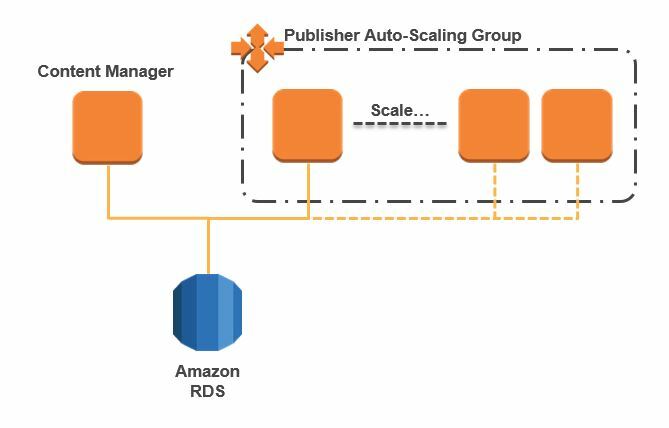 Our high-level architecture is shown in figure 1, and consists of a database, AWS RDS, a Content Manager and a Publisher in an auto-scaling group which will have the ability to scale up and down with demand. Because this is a test architecture focusing on publishing, the Content Manager is not scaled or is redundant. 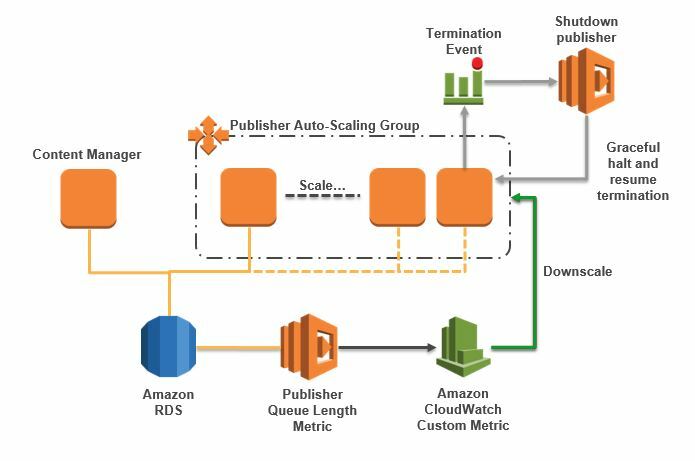 In a production scenario you would probably choose to place the Content Manager behind a load balancer and in its own auto-scaling group. I have also chosen to ignore some additional complications of elements such as Workflow Agents and Search Indexing. To get the Publishers to scale horizontally, we need to understand what the demand is at a given point in time and scale accordingly. More often than not CPU Utilization is a good metric that shows demand; CPU Utilization is high, therefore you add more capacity to reduce overall utilization. However, Publishers do not work like this, they typically run at a high utilization regardless of demand and therefore this is not a good measure. Demand comes in the form of the queue of items that are waiting so we need to establish if we have 100 or 100,000 items in the queue. To do this I use a Lambda function to query SDL Web and provide a Custom CloudWatch Metric showing the Queue length. This metric will simply give us a number and I chose to get this directly from the database. You could query the RESTFUL API of SDL Web but this is both a little more complex and, in my opinion probably a slower approach; a quick database query will provide what we need for the metric. 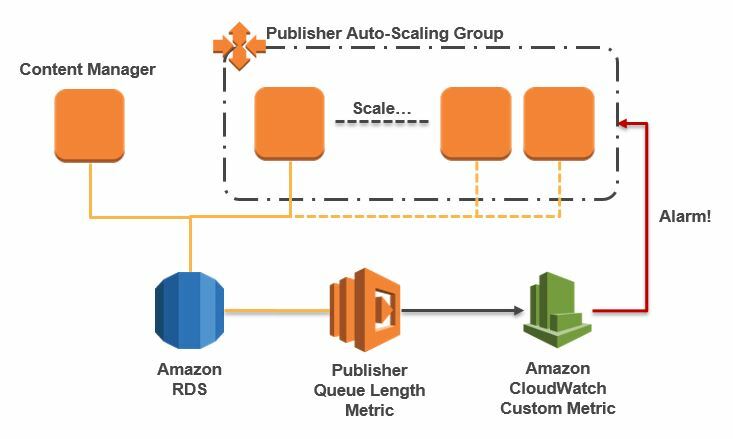 This will give us a metric which we can then find back in CloudWatch metrics under “SDL Web” and then “Publishing/Queue/Waiting for Publish”. We are then going to set a CloudWatch Alarm to alarm when load is over 100 items in the queue for a sustained period of 5 minutes. As demand drops, the auto-scaling group will be set to lower amounts and will eventually return to 1 instance running (the minimum in our auto-scaling group). So now, we have our Lambda generating our metric and an alarm triggering the auto-scaling group which will then add more instances based upon how high demand is (figure 2). As content editors publish items they will be a small delay, 5 minutes, and then new publishers will be added to publish the content items in the queue. This is just an example on how you could do this. The way the alarm reacts and how quickly up or down you scale is all configurable. Earlier in this post I also mentioned that you typically see higher loads at certain times of the day. As such, we could just add a new publisher at 4 PM to handle the increased load proactively rather that reactively. The choice is yours on how you address this. Once we resume the termination, the instance is terminated and the auto-scaling group has been downsized.